Innovation is a topic that’s talked about, agonized over, and disputed in every forward-thinking company, but few companies really know how to cultivate and operationalize a robust innovation practice. With a well established internal innovation practice to collect and review ideas and top down funding and support, our client, a multinational firm, was already ahead of the innovation curve. But still, they were missing a critical element: a system to accelerate and scale their innovation process. They had found inconsistencies in their innovation process across the globe. Some regions were soliciting ideas or conducting experiments without sharing knowledge or updating best practices. Without full visibility across its regions, inefficiencies emerged. When they took stock of their global innovation community, the firm realized that they had inadvertently funded the same experiment in two different parts of the world. Their current tools weren’t helping to smooth out the process either. With their innovation framework in one place, learnings in another, and ideation someplace else, it was difficult to keep track of all the tools needed for their innovators to be successful. In collaboration with global management consulting firm A.T. Kearney, we introduced our client to the SenseiOS Conductor app, to help them grow and develop innovators with all levels of experience. Working together, we enhanced our client’s existing practice and mapped the new protocols to an innovation funnel within Conductor. 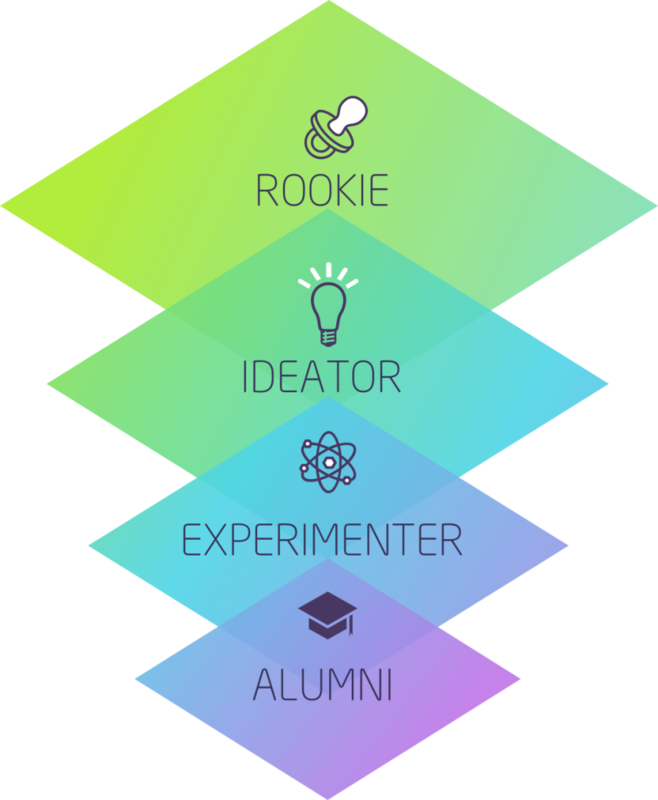 At each stage, innovators were presented with new opportunities to learn, contribute, and innovate. Each phase of the Innovation Funnel was carefully laid out, requiring innovators to complete a series of actions before they could move on to the next phase. For example, new contributors received training on how to refine their initial proposed idea to ensure that it was innovative and disruptive while still being feasible. This training had to be completed before an idea could be submitted to ensure that ideas met the client’s expectations and criteria. These phases also helped to secure buy-in from stakeholders who would be impacted by the idea and provided innovators with the coaching needed to become champions of their idea within the company. 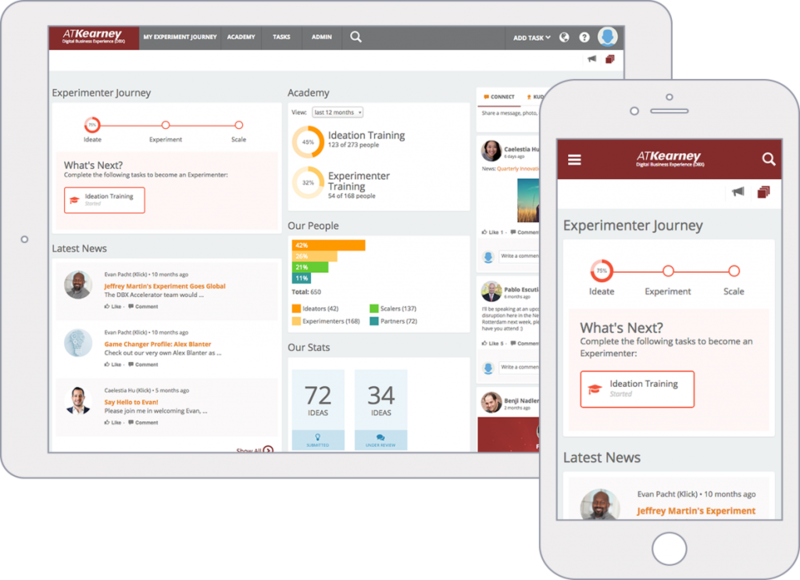 All the required training – from ideation to experimentation – was hosted within the Conductor app, making this phased approach possible. 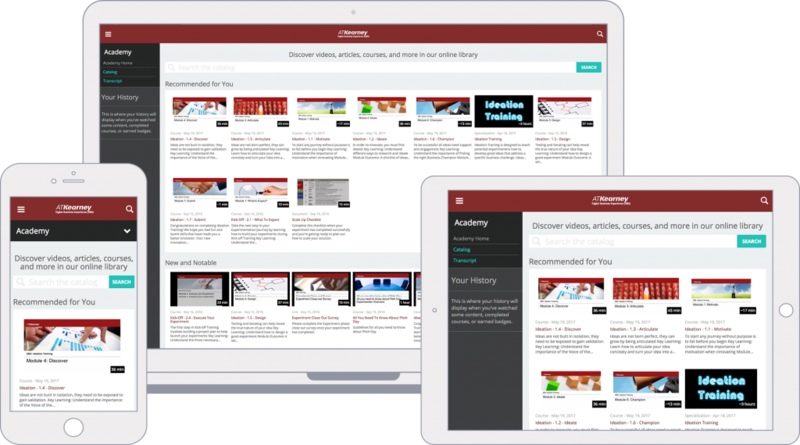 By integrating with SenseiOS’ interactive knowledge management app, Academy, innovators had access to a catalogue of internally created and externally sourced courses and specialties to help move innovators along their journey. Innovators could enroll in courses on topics like Selling Your Idea and specializations like Mobilizing an Implementation Team, depending on their innovation funnel phase, the theme of their proposed idea, or other criteria. Knowing that great ideas can come from every corner of the company and the globe, our client wanted to tap into the entire organization. 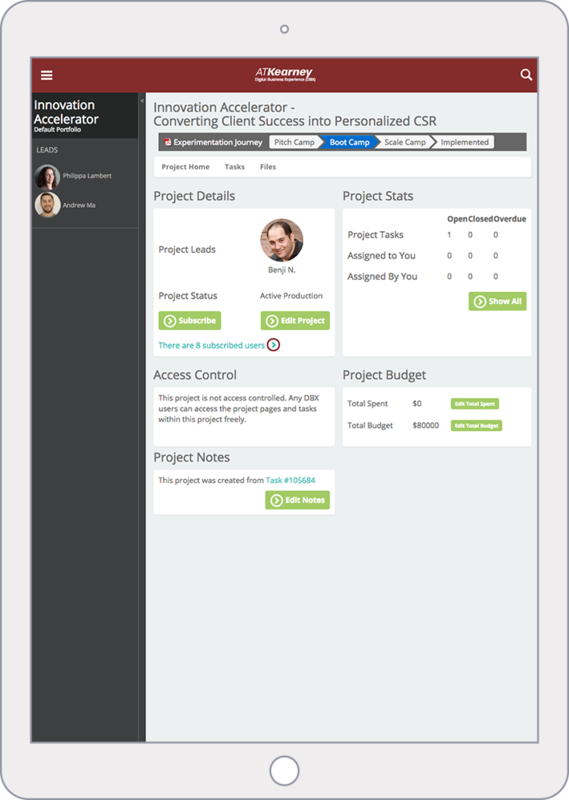 Any team member could submit their ideas through the central innovation portal. The Innovation Committee and other team members involved in a given project would then review and comment on the ideas, contributing to their evolution and ultimately, providing funding and mentorship through the idea’s execution. To push boundaries, drive collaboration, and cross-pollinate ideas and perspectives, the firm went the extra mile by inviting its external partners to join it’s growing Innovation Community. Through Conductor, they could grant guests and external partners the limited access needed to participate or lead experiments without jeopardizing the privacy and security of its patients, team members and property. With strict access controls, external partners had access to all documents, communications, and tasks to fully participate in the right experiments, while securely preventing access to all other experiments. As part of their innovation protocol, the firm’s leadership team would issue challenges as an effective call to action for ideas around a particular theme or topic. Often, the challenge was to either provide a solution a pressing problem or just to simply inspire out-of-the-box, disruptive thinking. Once ideas were ready to be reviewed, the head of the Innovation Committee was notified, reviewed the idea, and either accepted it, rejected it, or collaborated with the ideators to improve it. Once their ideas were accepted, innovators were invited to present at Pitch Day, a “Shark Tank” style vetting process, where top ideas were pitched to the entire Innovation Committee. To prepare them for Pitch Day, teams received a new series of training and planning tools to prepare them sell their idea to the Committee. These tools provided the guidance needed to develop budgets, logistics plans, and the plan resourcing requirements to not only make their idea feasible, but scalable and aligned to their objectives. They also received coaching on how to craft their pitch deck and message for the best results at Pitch Day. Throughout the entire process, breadcrumbs let innovators visualize their progression through their innovation journey. Ideas approved during Pitch Day were allocated funds from the Innovation Centre’s budget, converting the idea to a fully funded experiment. Approving an idea in the Conductor app triggered the creation of a series of automated tasks that help innovators understand “what’s next?”. Guiding the innovator through their experiment, these tasks prompted them to complete kick-off training, give feedback on the pitch process, and meet their assigned Business Champion. By automatically integrating the feedback survey and the Business Champion program with pitch approval, our client was able to ensure that they continually evolve, and constantly improve the innovation process. whether any experiments were at risk of failing. 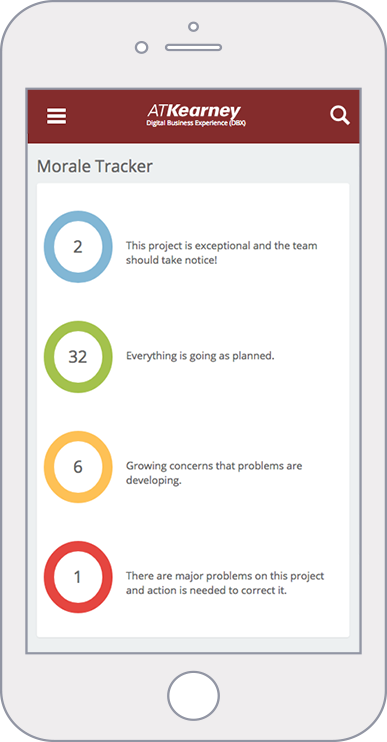 Conductor’s Project Reviews feature gave leaders a regular pulse check and visual cue as to which projects were doing well and which were becoming unfeasible. An automated bi-weekly notification distributed a survey to all innovators asking how they felt their experiment was going. With a few short questions – for example, “Do you feel your experiment is still scalable?” – the leadership team had both quantitative and qualitative insight on the status of all funded experiments. Data collected here helped inform the leadership team’s funding decisions. The Conductor app has already shown its impact, amplifying the Innovation Community. In its first pilot, our client focused on its Emerging Markets region, issuing a challenge for disruptive ideas that use digital innovation to improve their patient and customer experience. 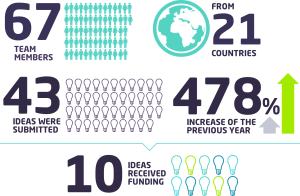 Within just four months, 67 team members participated from 21 countries, 43 ideas were submitted – a 478% increase of the previous year – and 10 ideas received funding. With the help of Conductor, our client now has the technology, engagement, and transparency needed to scale and operationalize innovation across their organization. Raising the bar in this monumental way has helped propel the firm toward its goal of being a digital leader by 2025.